It was common in the medieval period for great landowners to give land to religious orders; whose members would then be expected to pray for the donor’s souls in perpetuity. The image of purgatory was very real and everyone would have to spend time there irrespective of how pure their lives had been. No one wanted their soul to stay there very long, so it was thought that the prayers of the monks would ‘Fast Track’ the soul to Heaven. (see picture of monk). The Priory remained under its control until the 100 Years War. Tickford was considered one of the earliest of the Priory’s in Buckinghamshire. It would have consisted of cloister, chapel, great hall, Chapter House, refectory, infirmary and many other buildings. 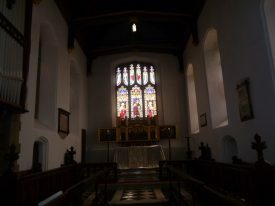 The Priory became quite wealthy and acquired the churches and tithes of over a dozen parishes in neighbourhood as well. 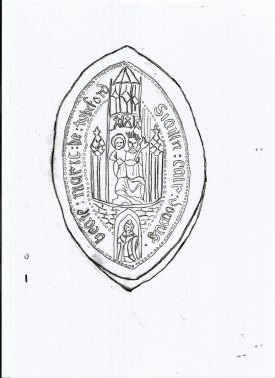 For example, in 1187 Gervase Pagnell the grandson of Fulk Pagnell, confirmed the gift with a charter bearing his seal. 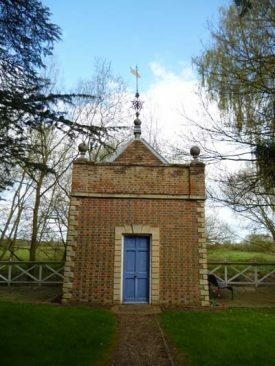 It mentioned land in several neighbouring villages and the parish churches of Newport Pagnell, Chicheley, Sherington, Bradwell, Willen and Astwood. It also included the water corn mill and 1 virgate of land at Caldicote, and the right to buy provisions free of toll in the market of Newport. Furthermore, John Someri gave the Priory the right to fish in the river, which ran to the north of the Priory, in exchange for fees and perquisites to the value of 13 shillings and 11 pence. It is interesting to note that this right continued well after the Dissolution of the Priory. The owner of one of the subsequent houses to stand on the site had a fishing pavilion built on the river’s edge. 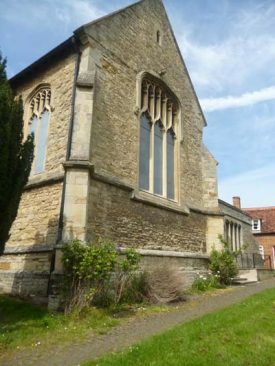 The Priory had the right to appoint the vicar of Newport Pagnell parish church. It also had to support him and he was given 20 shillings a year, a manse, clerk and a horse, which was probably stabled at the priory. Although he had his own house, the vicar was expected to take his meals in the refectory with the monks. Bread and Beer being the staple diet but there was also four meat dishes a week and fish on Friday. The meat would have been for any ‘lay people’ at the priory, as the monks were forbidden to eat meat unless they were ill and in the infirmary. They were allowed to eat fish but only on a Friday. During this century the periods of hostilities between England and France, known as the Hundred Years War, began. Because most of the priory’s were under French monastic control they were considered to be ‘alien’. Therefore, the Kings, in particular Edward 111 and Richard 11, were able to seize their incomes and lands to help fund the wars. In 1295 Tickford Priory had land confiscated by the King. In order to regain their lands, the priory’s had to pay a large fine. It wasn’t until 1301 that Tickford managed to pay off this fine and so gain control of their lands again. This would have had a detrimental effect to their wealth. In 1325 it was recorded that that the mill at Caldicote was broken and needed extensive repairs. The situation had obviously improved by 1250 as ii is known that the Priory employed a miller there. All priories were subject to inspections (visitations) from time to time. Often there were problems with whom should do these visitations. The French monasteries i.e. Mother Houses, thought that only they could do this and impose discipline on any unruly priories. On the other hand, the English Bishops felt it was their right to do these inspections if the priory was situated in their diocese. 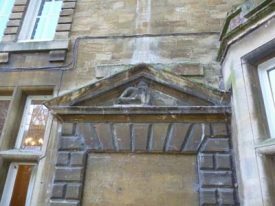 This caused many problems, particularly in the case of Tickford Priory which came under Lincoln. After a visitation by the Bishop of Lincoln in 1233, it was recorded that the Prior kept the rule of St Benedict so badly that it was a scandal. Plus, the number of monks in residence was well below the originally intended number. The Bishop of Lincoln therefore ordered that it should mend its ways. There is little evidence that this occurred as the following will show. From 1243 the Priory was once more under the control of the Abbot of Marmoutier and in 1275 he appointed Simon de Reda as Prior of Tickford. He was not a good choice and by June 1278 the situation at the priory was so unruly that King Edward 1 had to act. He in ordered Reginald de Grey to seize the priory and arrest the group of monks who had been wasting the priory’s goods and Imprisoned Prior Simon. Plus, John de Cheney, Sherriff of Buckinghamshire, was to lock up the ringleader in Windsor Castle. This still did not restore and the rebellious monks continued in persecuting Prior Simon. He was eventually freed but the priory was still in the state of chaos when the Bishop Oliver Sutton visited in 1290. Some of the monks resisted his visit and declared that only the Abbot of Marmoutier had the right to visit and correct them. He responded by excommunicating them and they complained to their Abbot. He in turn, appealed to Pope Nicholas IV for help. The Pope appointed the Benedictine Abbot of St. Albans and the Cluniac Prior of St Andrew’s Northampton to decide who had the right to visit Tickford . However, during this time, Bishop Oliver had been at Tickford Priory long enough to discover that the real cause of all the troubles was the Prior Simon himself. He had played the role of the injured party to divert attention from his own disreputable behaviour. Commissioners from the Bishop returned to Tickford in 1291 to gather further information and in September Prior Simon was deposed. The charges laid against him were waste of the priory’s goods, sexual incontinence and homicide. The Abbot of Marmoutier should have sole right to visit Tickford Priory. The Bishops of Lincoln would confirm any priors appointed by Abbot of Marmoutier. Who would then swear obedience to Bishop of Lincoln. new Prior was installed and not at any other occasion e.g. visitation. About 1311 there was a fire at Tickford, which destroyed all the charters recording grants of land and privileges to the monks. A new charter, was therefore obtained from the King. It is possible that before this date the building was mostly wood and would have been replaced by a stone building. This placed a further strain on the priory’s finances. In 1329 during the reign of Edward 11, Prior William Menevire was accused, with accomplices, of stealing goods from John Kimble of Filgrave. This was another example of the poor discipline and morale which had been shown earlier in 13th C by the activities of Prior Simon de Reda. In 1386, John Dvien, Prior or Tickford since 1383 was turned out of Office by a Proctor appointed by a Parlimentary Statute. This stated that all ‘alien’ priors, not appointed for life could be expelled. However, when Richard 11 lodged at Tickford Priory on his way to Scotland. 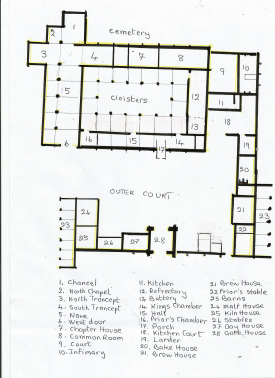 (There is a room called the King’s Chamber on the Priory plan). John Dvien petitioned the king to be re-instated and he was successful and restored to Office. At the end of the Hundred Years War, Tickford and Holy Trinity Priory (York) were the only two priories belonging to the Abbey of Marmoutier left in England. In 1426 Tickford Priory became subject to Holy Trinity Priory in York and the Abbot of Marmoutier no longer had any authority over it. This solved a long running dispute as previously mentioned. 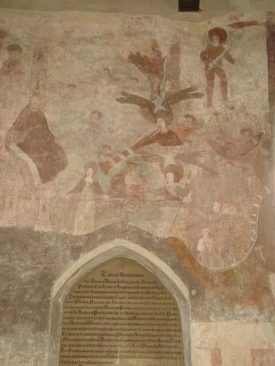 During this period, the monks appear to have been better behaved and the Priory fulfilled its commitments to the Parish Church in Newport Pagnell. Priories were responsible for the maintenance of the Chancel, with the parishioners looking after the Nave and churchyard. However, during the late 15th century and early 16thcentury, many monasteries failed to uphold their responsibilities and as a result, churches were poorly maintained. 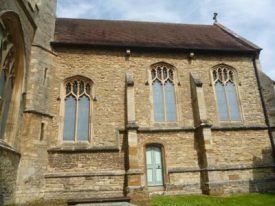 In contrast, Tickford Priory rebuilt the Chancel and its design remains today even if the stonework has had to be replaced over time and especially in the Victorian era. 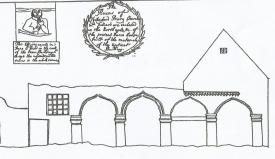 In 1524 after petitioning by Cardinal Wolsey, the Pope gave permission for certain religious houses to be suppressed and their revenues diverted to Cardinal Wolsey’s grand scheme for a new college at Oxford. Three Commissioners were appointed to visit the religious houses chosen for suppression. These were Dr Walter Burbank, Archdeacon of Carlisle, Sir William Gascoyne and Thomas Cromwell. Walter Burbank was the only one of the three to visit Tickford and on 5thFebruary 1525 The Prior officially surrendered the Priory to him. This took place in the Chapter House with the Priory Seal being ceremonially broken. (see picture of the seal.) A meticulous survey of lands and buildings was then made. The Monastery and lands were valued at £126 17s. 0d. The last prior was given a pension and the Income from letting the buildings and land was paid to the Cardinal’s College. This later became Christ Church College Oxford. 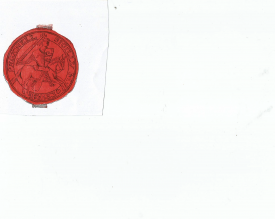 After the death in prison of Cardinal Wolsey, Tickford Priory passed to the crown i.e. Henry V111. 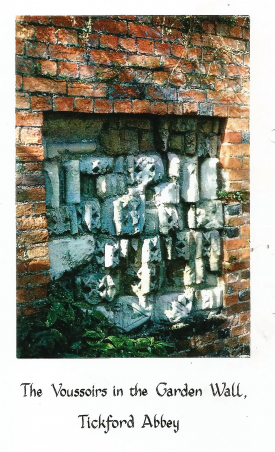 Nothing remains today of the Priory except for Voussiours (parts of stonework such as arches) in a garden wall and a rather curious carving of a monk over a doorway. 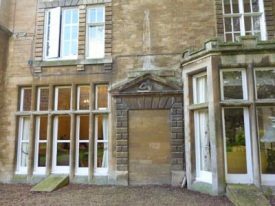 In 1703 the Antiquarian Browne Willis made a drawing of the only ruins that remained (see picture) but these had disappeared by 19thCentury.